In what was one of the less entertaining El Clasicos of recent times, Real Madrid sprung a surprise and out fought a seemingly invincible Barcelona side, claiming a 2-1 win. The first half ended scoreless, but Gerard Pique headed Barcelona ahead, only for Karim Benzema and Cristiano Ronaldo to turn the tables in an open second half. Luis Enrique sent out his trusty first XI. Zidane sent out the expected XI, with Casemiro playing in defensive midfield and Daniel Carvajal at right back. James Rodriguez, Isco and Danilo were all benched. Unlike many matches which tend to fluctuate heavily within and between halves (Bayern Munich vs Juventus), this match largely maintained trends, only evolving in smaller ways. This likely comes down to the fact that both these sides are familiar with eachother as well. There were very few changes to the starting XIs between the clasico in October 2014 and this one 18 months and 2 Clasicos later. If anything, this match bucked the trend and didn’t play out as expected. In retrospect the Frenchman’s press conferences since becoming manager have emphasized his desire for attacking football. However, this match was notable for how he emphasized off the ball duties for all his players. The Brazilian embodied the destructive, anarchic nature of Real Madrid, and the match as a whole. Never shy to tackle, intercept, or foul- his role was somewhat similar to that of Pepe in Clasicos during the Mourinho era- to break up play. However, Pepe had to deal with the greatest Barcelona midfield ever, and needed considerable positional awareness to even compete with Xavi and Iniesta. In contrast, Casemiro ‘only’ had to deal with a formidable front 3- this Barcelona midfield, while very capable, doesn’t take charge of matches in the same way as in Guardiola’s years. 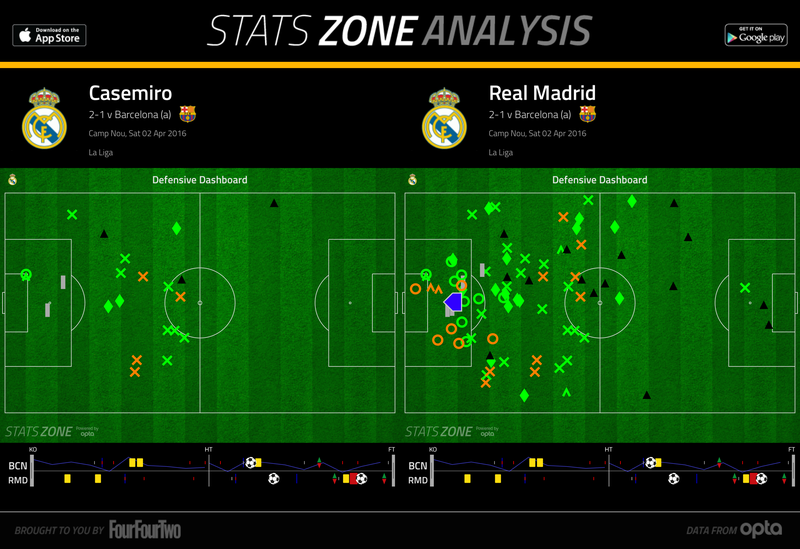 Casemiro’s role was to sit back and essentially crowd out attackers and break up play with heavy tackles. When Barcelona played near Real Madrid’s box, he sat in front of the center backs and either man marked Luis Suarez, attacked Rakitic or Iniesta, or disrupted Lionel Messi. When Real Madrid looked to unsettle Barcelona and press high, Casemiro ensured Real were never caught out disorganized- he often fouled in more advanced positions, even pushing Messi over deep in Barcelona’s half at one point. 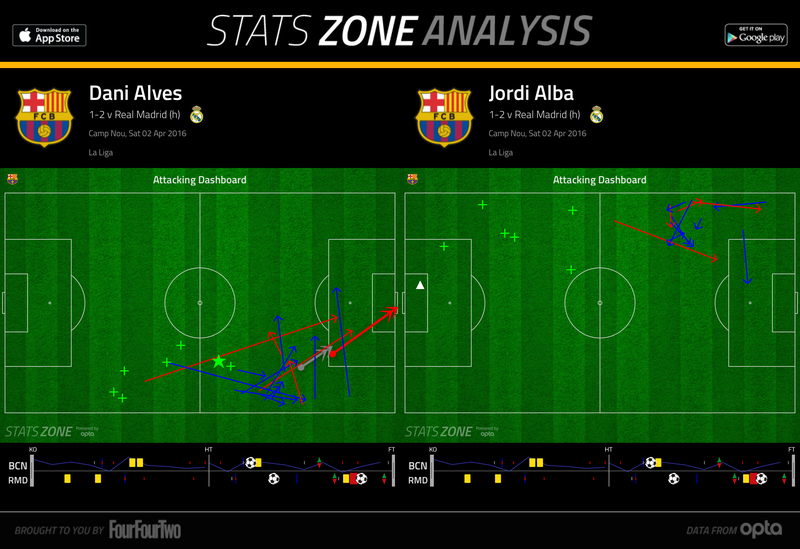 The Brazilians defensive dashboard above showcases his influence. 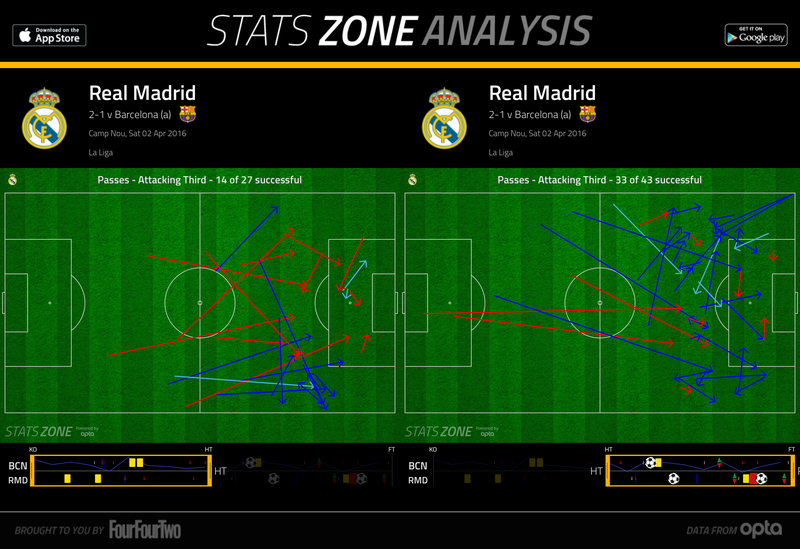 He completely disrupted Barcelona’s rhythm, particularly their attacking transitions as the game progressed. Most importantly, along with his teammates, he completely shut out Barcelona’s front 3. Casemiro himself focused on Messi, and slotted in at center back late in the game to deal with Suarez , while Carvajal dealt admirably with Neymar. While sticking Casemiro in front of the back 4 in place of galactico James Rodriguez and crowd favorite Isco was a relatively easy task after the reverse fixture, persuading both of your superstar wingers to help out defensively is another job entirely. Ronaldo, for one, typically stays forward, although he tracks back for corners. Bale helped out defensively when he first arrived in the Spanish capital- such as in the Champions League winning season, but even Ancelotti couldn’t stop him from abandoning this work rate during his second season in charge. However, this is precisely why many believe Zidane has all of the tools needed to succeed as manager. The World Cup winner commands a level of respect which even Carlo Ancelotti didn’t from his players. It’s hard to imagine Rafa Benitez or anyone else convincing Ronaldo or Bale to play as midfielders off the ball. With both of Real Madrid’s wingers tucking in, it made Real Madrid’s job infinitely easier out wide. Rather than defending in a 4-3-3, Zidane set out a compact 4-5-1 off the ball. Having shut down the center of the pitch, the capital club was most prone to overlapping runs from Jordi Alba and Dani Alves- which were stopped by Ronaldo, Bale, Marcelo or Carvajal. Perhaps the most significant event of the match was actually in the 40th minute, when Ronaldo tracked a Jordi Alba run deep into his own box, snuffing out the danger. Not only was Ronaldo defending, but he was doing so on the opposite wing. Bale and Ronaldo often switched wings seamlessly as the match progressed, it was never a forced change as it has been in the past. It was clear that Real Madrid planned to crowd out the center of the pitch and hope to force wide players inside, especially focusing on the front 3 and the full backs- often the players who unlock these matches. This left the majority of creative work to Barcelona’s midfield- Busquets, Rakitic and Iniesta. Busquets was by far the most influential player (offensively, at least) on the pitch, but he was also the least advanced of the midfield trio. In terms of circulation, the Spaniard did a fine job, and he has never been known for his game changing through balls either. As the game progressed, however, he grew very fatigued, and struggled in transitions from attack to defense. Busquets managed to control proceedings well enough up till Pique’s goal, following which he was continously exposed. Andres Iniesta was also very influential, and his dribbling, rest over the international break, and experience ensured he was ready for this kind of a match. Iniesta has single handedly split open defenses in the past- most notably against Paris Saint Germain. But he also played in an advanced position closer to Casemiro, and struggled with Real’s physicality. The Brazilians frequent fouls simply upset his rhythm. It’s of no surprise that Ivan Rakitic was the best Barcelona midfielder, or attacker, on the pitch. The Croatian’s physicality allowed him to mix it with the aggressive Casemiro, and his all round play maintained Barcelona’s balance. Rakitic was the only midfielder who could go toe to toe with his Real Madrid counterparts. It’s no coincidence that his withdrawal for Arda Turan also ended any control Barcelona had in midfield. While Turan wasn’t the worst substitute for Rakitic, he was not prepared to help form a defensive fulcrum alongside Busquets in midfield. A better substitution, and more of a like–for-like replacement would have been Turan for Iniesta. Both men are talented on the ball and help out defensively, but are more renown for their offensive skills. However, this is where Barcelona’s lack of options in midfield hurt them – a draining season has left the majority of their players fatigued. If anything, however, Luis Enrique’s reluctance to send on Sergi Roberto was strange, the Spaniard was a better fit, if a less creative one, than Turan. With the domestic title sewn up, it wasn’t exactly a risk, either. The substitution of Rakitic, as stated earlier, hurt Barcelona’s midfield. Not only did Turan fail to replicate Rakitic’s physical presence in midfield, but he also contributed to the considerable worsening of Barcelona’s transitions from attack to defense. Even when reduced to 10 men, the lack of defensive effort from Barcelona’s wingers meant that Real Madrid could easily bypass Busquets and distribute the ball out wide. Visibly, Madrid’s players grew into the game, and were far fitter than their Barcelona counterparts towards the end of the game. Indeed, Barcelona’s best period of play was around the 25th minute, after which the side gradually stagnated. The introduction of Jesé late in the game also exacerbated Barcelona’s issue. His pace made him a bigger threat on the counter-attack than Benzema was, and coincided with Rakitic’s withdrawal. Barring the 2014-15 season when Carlo Ancelotti set up a side which nearly out-possessed Barcelona, the majority of matches between these sides have been the same. One side counter-attacked, the other bossed the ball. Casemiro’s inclusion made this Clasico reminiscent of those in 2011, while Zidane’s status allowed him to unite his entire team off the ball. Barcelona’s greater reliance on its front 3, while understandable, arguably came back to haunt them. The result could’ve been entirely different if Enrique had a certain Pedro to introduce late in the game, and none of their midfielders really took control of the occasion. With Real Madrid happy to sit back, the Catalan club never really got out of third gear. Ultimately, one could say that this match boiled down to fitness. Barcelona’s players have been through a World Cup, two grueling seasons (nearly), and a Copa America in the past 2 years. The toll of a treble winning season and all the additional flight hours (Club World Cup) is beginning to manifest, as Enrique faces the problems Ancelotti faced an year ago. Barcelona’s performance in a burst was similar to their win against Atletico in January, when they were out run by 9 men. In contrast, Real Madrid did not participate in the majority of the Copa Del Rey, and Zinedine Zidane’s intense training plan in January seems to have payed off. It will be interesting to see how both sides progress in the Champion’s League.